When Michael Scott - AKA my brother - recently visited California, he had a difficulty exiting a rental car and said, "Ooh, sorry, had a lot of curbswell here." I said, "Don't sweat it. At least it's a rental." Curbswell is one of many Sniglets that has been in my family's vernacular for about 26 years. Sniglets are made up words that make total sense and were put together in a 1984 book by comedian Rich Hall. Curbswell, for example, is a seismic condition in which the curb on the passenger side of a car rises and wedges a car door. I find myself inventing Sniglets now and again and the other day was wondering: What in the world ever happened to Rich Hall? Apparently, Hall lives in London, had some TV shows there and is often on quiz shows, where he is known for being an excellent participant. 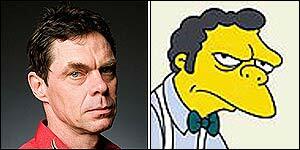 I also have discovered that he is the inspiration for the bartender Moe in "The Simpsons." Huh, who knew? One Sniglet a student of mine invented that I think is brilliant is "lovike." Sometimes in a relationship, it is inappropriate to say both "I love you" and "I like you." Lovike is in between those two, and I think it's a necessary word. Anyone who checks out this mega-list of Sniglets is likely to find words that have been experienced. On a recent plane ride, I experienced "elbonics" - jockeying for the arm rest with a stranger. I also have walked on "cinemuck" - the combination of popcorn, soda, and melted chocolate that covers the floors of movie theaters. I have also participated in "tubswizzle" - sliding back and forth in the bathtub to mix the too hot water with the cooler water. I respect Hall for not milking Sniglets too much. He did his Sniglet thing in the '80s, then stopped when the '90s hit and moved to England to become their quiz-show version of Charles Nelson Reilly and/or Richard Dawson. The Snooze Button Generation thanks him for his words, including "grantnap," the extra five minutes of sleep you allow yourself that somehow makes all the difference in the world.